Modern Dental Care is proud to announce that it is equipped with the CS 9000 3D a state of the art Extraoral Imaging System (Cone Beam Computed Tomography (CBCT) systems) which is renowned for offering the highest resolution images with the lowest radiation dose. 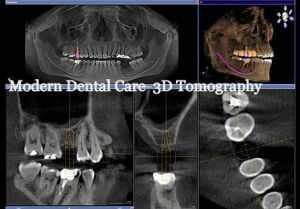 Panoramic Dental X-ray helps find problems with the teeth, mouth, and jaw. Dental X-ray images show everything that cannot be visible during simple check-up: tooth decay, hidden wisdom teeth problems, bone structure. Often Dental X-ray is done to check results of dental treatment. • Find problems in the mouth such as decayed tooth/ teeth, damaged bones supporting the teeth, and dental injuries (broken tooth roots and etc). Dental X-rays are often done to find these problems to avoid complications. • Find teeth that are badly placed or cannot erupt the through gum properly. • Find cysts, tumors, or abscesses. • To locate permanent teeth growing in the children jaw. Contact Modern Dental Care Mauritius for more information about Panoramic Dental X-Ray.